Tampa International Airport (IATA: TPA, ICAO: KTPA, FAA LID: TPA) is a major airport to the west of Tampa. 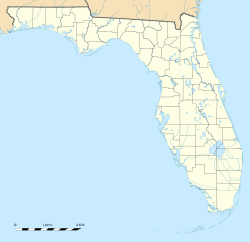 It is in Hillsborough County, Florida, United States. This airport is owned by Hillsborough County Aviation Authority. It serves the Tampa Bay Area. Many good things have been said about the airport's architecture and Landside/Airside design. It has a central terminal ("landside") connected by people movers to gates that are not at the terminal ("airsides"). It was first designed in the late 1960s. The airport was known as Drew Field Municipal Airport until 1952. FAA diagram of Tampa International Airport. A Northwest Airlines Boeing 757 at Tampa in 1998. Northwest stopped flying in 2010. Three planes parked at the terminal in 2014. ↑ 1.0 1.1 FAA Airport Master Record for TPA (Form 5010 PDF), effective 2009-05-07. ↑ "This domain was registered by Youdot.io". madduxpress.com. ↑ "The Southwest Airlines Community". www.southwestaircommunity.com. ↑ "Tampa International Airport ends FY2015 with highest passenger numbers since 2008 - Tampa International Airport". www.tampaairport.com. ↑ "Homepage - Tampa International Airport". www.tampaairport.com.